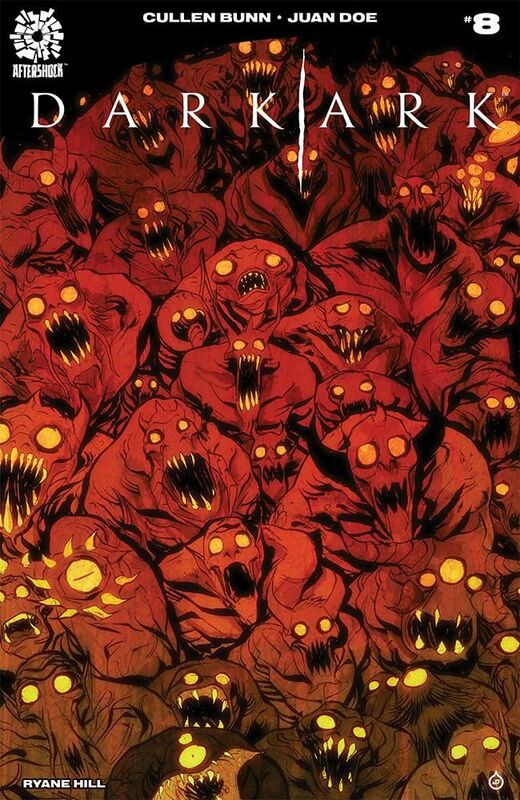 Dark Ark #8 Review – AiPT! Dark Ark #8: Old Gods comes out this week from Aftershock comics with some exciting revelations. This issue continues the trend of flashing back to before the flood, while also telling the events of the present. 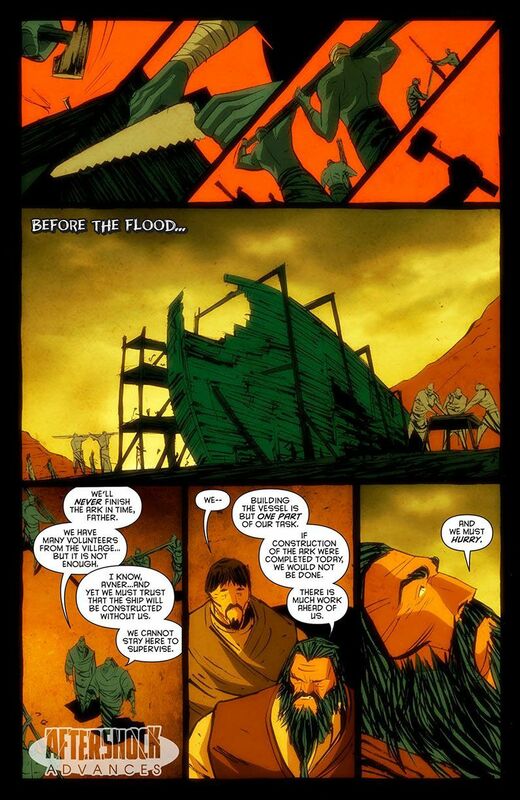 We start out with Share and his oldest son Avner leaving the building of the Ark to the “volunteers” as they set off to gather as many monsters as they can before the flood. Shrae’s daughter Khalee takes her new friend Janris to a secret cave that her father uses as a workshop. Inside the cave she shows Janris some ancient stone tablets depicting different tribes of beasts and demons. Khalee warns that she believes that these are the true passengers that her father intends to bring on board the ark and she is afraid that the human volunteers may become food for these creatures along the journey. While the two girls are snooping around the cave, Shrae, Avner, and a group of men loyal to him come upon the cave of the manticore Krull. As they approach, the fearsome creature asks them why they have come. Shrae warns Krull of the coming flood and offers salvation. Krull tells the sorcerer that he does not want saving and that maybe he wants to die since he has been in this world for so long. Meanwhile, in the present, Shree travels to the giant mysterious creature that has been tormenting Noah’s Ark. The dark sorcerer is carried to the beast by a bird demon. Shrae sacrifices it to the beast as tribute for an audience, and the monster reveals that it is in fact an ancient creature from before the time of this current God and Devil, and much more powerful than either. She tells Shrae that she is Echidna, the mother of all monsters. She and her now-deceased mate Typhon were children of the ancient Titans and created all of the monsters of this world. Shrae offers a tribute of all the humans aboard the Dark Ark in exchange for Noah’s safe passage to the new world. The massive monster asks Shrae if he plans to honor the old ways and serve her. Shrae tells her that he already serves a master and that it is this master’s will that her children survive. The giant goddess laughs at the sorcerer, telling him that she is far more powerful than any God he serves and that she still has influence over her children and can take his ark whenever she pleases. Back on the ark Khalee and Janris await Shrae’s return. Khalee assures her friend that she will not let her father give her over to the manticore. Below deck where all the demons and unnatural creatures have gathered, there was a sudden sense that their ancient mother is alive and she speaks to them calling them to her. The beasts reply back to Echidna that they hear her and that they will obey. As they rip up through to the upper deck of the ark to join with her, Khalee and Janris watch in horror for fear the beasts are coming for them. Juan Doe’s artwork is beautiful as always, but is not where this issue truly shines this time around. It looks good and there are some really interesting ideas in the way that Echidna looks. Shrae uses her body as a platform to talk to her while her tentacles shoot up from the water with mouths full of jagged teeth all over them like suction cups. There isn’t a lot of action in this issue however, and that tends to make the artwork feel a little subdued. It is on par with previous issues of this series in its attention to detail and wonderful use of color and contrast, but the energy feels a bit muted. The story in this issue is very pivotal. We discover the existence of old gods even more ancient than the current ones and much more powerful. Cullen Bunn brilliantly creates this character Echidna as the mother of all monsters, and in doing so also creates a power struggle within the context of the story. She can command and control the dark unnatural creatures aboard the ark, whereas before Shrae could hold the monsters at bay from attacking Noah’s Ark and devouring its inhabitants because the Dark Lord commanded it. Now they are under the influence of their ancient mother who has been tormenting and feeding on Noah’s Ark for some time. This is definitely setting up for some serious drama and conflict between the Dark Lord, Shrae, Echidna and all the inhabitants of the Dark Ark. Cullen Bunn’s story really makes this issue stand out and really changes a lot of things for the issues to come. This is very exciting masterful storytelling and it is what makes the series so wonderful and compelling to read. Overall this issue is a must-have for any collector of the series, especially with the revelation of this new Godmother of Monsters. The issue as a whole is not as exciting or action-packed as others but it does change a lot in terms of the story and events to come. Dark Ark #8 is a worthy installment in this groundbreaking series from Aftershock. It is not as exciting and action-packed as other issues but it does contain elements to the story that are sure to change everything in the issues to follow. Overall this issue is important to the story but the action and excitement in other areas feels a bit muted as a result. The overall tone and intensity of this issue seem to be one note.